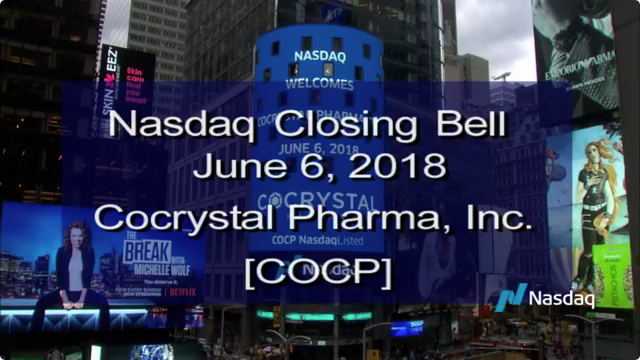 BOTHELL, WA, April 01, 2019 (GLOBE NEWSWIRE) -- Cocrystal Pharma, Inc. (NASDAQ: COCP), (“Cocrystal” or the “Company”), a clinical stage biotechnology company discovering and developing novel antiviral therapeutics, announced today its financial results for the year ended December 31, 2018 and provided a corporate overview and business outlook for 2019. Signed exclusive license and collaboration agreement with Merck Sharp & Dohme Corp. to discover and develop certain proprietary influenza A/B antiviral agents. Secured a total of $17 million over the past 12 months; $4 million from upfront payment from Merck and $13 million from common-stock only financings led by fundamental healthcare focused institutional investors. Reported encouraging safety and preliminary efficacy data for its U.S. Phase 2a study evaluating CC-31244 for the ultra-short treatment of hepatitis C virus (HCV) infected individuals showing no drug-drug interactions and substantial efficacy. The data obtained from this trial used 2 weeks of CC-31244 in combination with Epclusa followed by 4 weeks of Epclusa alone. Signed Clinical Trial Agreement for investigator-initiated Phase 2a study in Hong Kong of CC-31244 in a novel combination therapy for ultra-short treatment of hepatitis C (HepC). Presented preclinical characterization data of CC-42344 at the 6th ISIRV-AVG Conference demonstrating excellent antiviral activity against influenza A strains and favorable pharmacokinetic and safety profile. Successfully completed up-listing on the Nasdaq Capital Market. “Over the course of 2018, we accomplished a number of corporate and clinical milestones including our up-listing on Nasdaq, the advancement of our CC-31244 HepC Phase 2 program, our recent collaboration with Merck and additional progress advancing our proprietary platform technology. This notable progress has provided the Company with a solid foundation which we believe will enable us to continue driving value-creating momentum as we are well-funded and positioned to achieve numerous operational, clinical and regulatory milestones in 2019,” commented Dr. Gary Wilcox, Chairman and Chief Executive Officer of Cocrystal. The Company recently announced safety and preliminary efficacy data for its triple regimen, U.S. Phase 2a study evaluating CC-31244 and Epclusa (sofosbuvir/velpatasvir) for the ultra-short treatment of HCV infected individuals. The U.S. Phase 2a study is an open-label study designed to evaluate the safety, tolerability, and preliminary efficacy of CC-31244 and Epclusa, an approved 12-week therapy for HCV developed by Gilead Sciences, Inc, in 12 subjects with treatment-naïve HCV genotype 1. Subjects received oral 400 mg of CC-31244 and Epclusa for 2 weeks. Following this, the subjects continued Epclusa treatment alone for another 4 weeks. All subjects completed the 6-week treatment regimen. The treatment was well tolerated with no study discontinuations due to adverse events. Eight of 12 subjects achieved the primary efficacy endpoint of sustained virologic response at 12 weeks after completion of treatment (SVR12). SVR12 is defined as undetectable virus in blood 12 weeks after completion of treatment and is considered a virologic cure. For additional information about the U.S. Phase 2a study of CC-31244 for the treatment of viral hepatitis C, please visit ClinicalTrials.gov and reference identifier NCT03501550. Plans are underway to commence a second study in the HCV clinical development program, a Phase 2a investigator sponsored study in Hong Kong evaluating the safety, tolerability and preliminary efficacy of CC-31244 in combination with sofosbuvir and daclatsavir with or without a protease inhibitor, for the treatment of hepatitis C. The Humanity & Health Research Centre expects to commence the study in Q2 2019. The upcoming, Hong Kong Phase 2a open-label trial differs from the current Phase 2a trial Cocrystal is conducting by using a protease inhibitor as part of the combination regimen and having a shorter treatment duration. Present full data of U.S. Phase 2a study at upcoming scientific conference. Commence Hong Kong Phase 2a study. Complete patient enrollment in Hong Kong Phase 2a study. Complete Hong Kong Phase 2a study and report top-line results. The Company recently announced it entered into an exclusive license and collaboration agreement with Merck to discover and develop certain proprietary influenza A/B antiviral agents. Under the terms of the agreement, Merck will fund all research and development for the program, including clinical development, and will be responsible for worldwide commercialization of any products derived from the collaboration. Cocrystal was paid a $4 million upfront license fee and is eligible to receive payments related to designated development, regulatory and sales milestones with the potential to earn up to $156 million, plus undisclosed royalties on product sales. Further, the Company has identified molecules which have activity against both Strain A and Strain B. Several of these have potencies approaching single digit nanomolar. The Company is considering oral, intravenous and inhaled routes of delivery. Initiate Phase 1 study evaluating CC-42344 for the treatment of influenza. Subsequent to the quarter end, on March 13, 2019, the Company closed a private placement of 1,602,283 shares of its common stock and received gross proceeds of $4,181,958, before deducting offering expenses and commissions. As of March 26, 2019, Cocrystal had approximately $8,700,000 cash on hand. Based on management’s current projections, the Company expects to have sufficient cash to fund operations into the first quarter of 2020. Research and development expenses were $4,667,000, exclusive of a $53,905,000 IPR&D impairment charge, for total R&D expenses of $58,572,000 for the year ended December 31, 2018, compared with $5,822,000 for the year ended December 31, 2017. Excluding the impact of the IPR&D impairment charge, research and development expenses decreased $1,155,000, for the year ended December 31, 2018. This year over year decrease in research and development expenditures was primarily due to decreased employee compensation costs after closing the Tucker, Georgia lab facility in the fourth quarter of 2017. Cocrystal expects research and development expenses to decrease in 2019 with the completion of the Phase 2a study in the U.S.
General and administrative expenses were $4,352,000 for the year ended December 31, 2018, compared with $2,440,000 for the year ended December 31, 2017. This increase of $1,912,000 was primarily due to an $896,000 insurance reimbursement received by the Company in 2017 for legal costs and a $132,000 non-cash reversal of stock compensation expense related to unvested options for executives that are no longer with the Company which decreased expenses during the year ended December 31, 2017. The Company also had increases in expenses during the year ended December 31, 2018 including approximately $141,000 in accounting fees related to SEC filings and $556,000 in legal costs associated with both litigation and collaboration matters, as well as listing the Company on Nasdaq Capital Market. Cocrystal Pharma, Inc. is a clinical stage biotechnology company discovering and developing novel antiviral therapeutics that target the replication machinery of influenza viruses, hepatitis C viruses, and noroviruses. Cocrystal employs unique structure-based technologies and Nobel Prize winning expertise to create first- and best-in-class antiviral drugs. The Company is developing CC-31244, an investigational, oral, broad-spectrum replication inhibitor called a non-nucleoside inhibitor (NNI). CC-31244 is currently being evaluated in Phase 2a studies for the treatment of hepatitis C as part of a cocktail for ultra-short therapy. Cocrystal recently entered into an exclusive worldwide license and collaboration agreement with Merck Sharp & Dohme Corp. to discover and develop certain proprietary influenza A/B antiviral agents. CC-42344, the Company’s molecule for the treatment of influenza A, is currently being evaluated in preclinical IND-enabling studies. In addition, the Company has a pipeline of promising early preclinical programs and continues to identify and develop non-nucleoside polymerase inhibitors for norovirus gastroenteritis using the Company’s proprietary structure-based drug design technology platform. For further information about Cocrystal, please visit www.cocrystalpharma.com. This press release contains forward-looking statements within the meaning of the Private Securities Litigation Reform Act of 1995, including advancements under our Merck collaboration agreement and completion of the preclinical and regulatory milestones, the results of the 31244 trials, achievement of operational, clinical and research milestones, reductions in research and development expenses in 2019 and our liquidity. The words "believe," "may," "estimate," "continue," "anticipate," "intend," "should," "plan," "could," "target," "potential," "is likely," "will," "expect" and similar expressions, as they relate to us, are intended to identify forward-looking statements. These forward-looking statements are based on Cocrystal’s current expectations and actual results could differ materially. There are a number of factors that could cause actual events to differ materially from those indicated by such forward-looking statements. These factors include, but are not limited to, risks arising from Merck’s continuing the collaboration agreement, the results from preclinical and clinical studies, the availability of products, the CROs’ ability to recruit subjects, receipt of regulatory approvals, general risks arising from all clinical trials, and unanticipated litigation and other expenses. See also the Risk Factors described in the Company’s most recent Annual Report on Form 10-K for the year ended December 31, 2018. The Company has based these forward-looking statements on its current expectations and assumptions about future events. While management considers these expectations and assumptions to be reasonable, they are inherently subject to significant business, economic, competitive, regulatory, and other risks, contingencies, and uncertainties, most of which are difficult to predict and many of which are beyond the Company’s control. The Company does not assume any obligations to update any of these forward-looking statements.